This rediscovered gem by Caldecott-winning illustrator Roger Duvoisin is perfect for a new generation of little girls who love dolls. In the city of Paris, a beautiful but lonely doll sits on a shelf in an antique shop. Shes surrounded by old vases and teapots, but longs for a friend to play with. 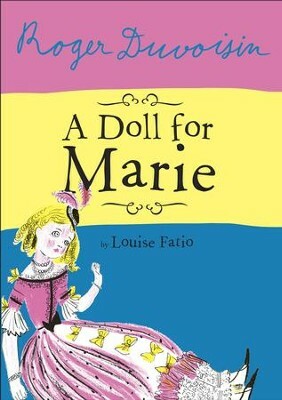 There is one little girl who would dearly love to own the doll, but Marie could never afford such a precious item. So Marie has to settle for admiring the doll through the window on her way home from school. But Marie and this doll are clearly meant for one another, and Marie will make sure that the doll has a home where she is loved. First published in the 1950s but long out of print, this rediscovered gem by Roger Duvoisin and his wife, Louise Fatio, is available again, ready to be read to little girlsand dollsof a new generation. Louise Fatio was the author of several books, including the Happy Lion books, all illustrated by her artist husband, Roger Duvoisin. She was born in 1904 in Switzerland and died in 1993 in New Jersey. Roger Duvoisin wrote and illustrated forty books, including those about Petunia the silly goose and Veronica the hippopotamus, and illustrated over a hundred more by other authors, many with his wife, Louise. He received the Caldecott Medal in 1947 for White Snow, Bright Snow and a Caldecott Honor in 1966 for Hide and Seek Fog, both written by Alvin Tresselt. Roger Duvoisin died in 1980. I'm the author/artist and I want to review A Doll For Marie - eBook.